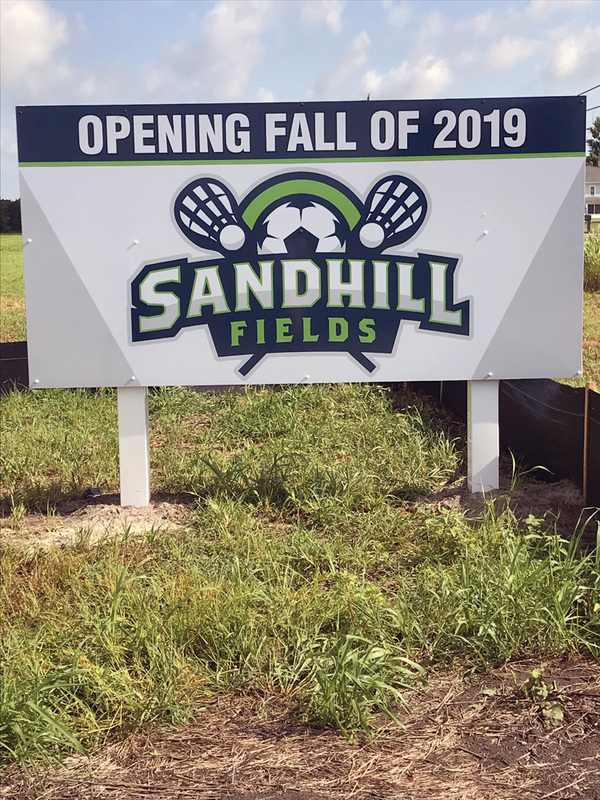 Sandhill Fields held a groundbreaking ceremony on Wednesday, August 22. The sports complex is located along Sand Hill Road near Georgetown, just off of Route 9 “in the heart of Sussex County.” It will feature eight regulation-sized soccer/lacrosse fields, six pickleball courts with pavilion, a 3.1-mile regulation cross-country course, 3.5 miles of walking trail, playground equipment, parking for up to 350 cars, picnic pavilions with restroom facilities and a food-truck area. “This is a great opportunity for the county and its residents,” said Joseph Schell, who is the president and secretary of the Sussex Sports Center Foundation, which is the group behind the facility. The eight soccer/lacrosse fields will be professionally installed, with Bermuda grass, and will be planted sometime in September. Currently, the complex is being prepared for construction, and most of the major field work is being done this year before the winter hits. The complex will operate as a public park facility, with access for anyone wishing to use its many facilities or just to enjoy the open space for a leisurely walk. It will be open to the general public during the daylight hours, with parking and access free of charge. SSCF was incorporated as a 501(c)(3) non-profit, charitable organization with 14 founding members back in January 2017. Their goal was to figure out if a sports complex of this nature was possible in Georgetown along Sand Hill Road with the land that was donated to the organization. The SSCF is led by Schell, as well as Vice-President Robert E. Horsey and Treasurer Steve Burke. Other Board of Directors members include Tim Bamforth, I.G. Burton, Zac Crouch, Gene Dvornick, Todd Lawson, Dennis March, Stephanie Parker, Preston Schell, Darren Short, Tony Sposato, Rob Tunnell, Bill West and state Sen. Brian Pettyjohn. The complex will serve as the home for many of Sussex County’s growing youth and adult athletic clubs, including the Henlopen Soccer and Saltwater Lacrosse programs. Due to the recent explosion in youth athletics, the county increasingly needed a recreational facility of this size and quality. The soccer club has roughly 1,300 boys and girls who participate yearly in their program, while the lacrosse club sees about 350 participants. The Seashore Striders, a recreational running organization, will also be using the complex. During the summer of 2017, the First State Pickleball Club, which has more than 400 members, made a request to the organization to consider adding as many pickleball courts as possible to the project to help accommodate the growing number of Sussex County residents who have taken up playing the sport of pickleball. Fundraising efforts have been ongoing for the better part of a year now, with more than $4 million raised toward the cost of the nearly $5.8 million project. The organization continues to actively seek tax-deductible donations from county businesses and government entities, as well as individuals and families. The organization’s initial efforts have enabled them to also create a reserve fund of $550,000 to cover any potential operational losses anticipated during the first few year of being open. They expect revenue will come in to continue operating the complex, with dues payments from the athletic clubs, as well as summer sports skills camps, sports tournaments and special events hosted on site. SSCF will employ or contract with two or three individuals to manage, market and maintain the center on a daily basis. For more information on the project, to find out how to become a sponsor, or just to donate to the organization, check out their website at www.thesportscenter.org.